My experiences using the online survey provider SoGo Surveys for academic research in understand the public perceptions of Aboriginal heritage. I have often heard it discussed that only Aboriginal people and social scientists such as archaeologists and anthropologists are interested in Aboriginal heritage– these are considered to be ‘special’ interests. It is this type of reasoning that is used to defend the legitimacy of the Ministers decision when an Aboriginal site is approved to be impacted by industry– because the development in question is in the ‘general interest of the community’, of which the Minister is bound to have regard for. The Minister should of course have regard for the interest of the general community, however this is based on the assumption that the preservation of significant Aboriginal sites is not always in the best interest of the community when it competes with mining interests. This is again based on the assumption that Aboriginal heritage is not valued by the wider Western Australian and Australian communities. It would appear evident that there are varying and divergent views on what is ‘significant’ and ‘important’ Aboriginal heritage– an important theoretical question in itself. This is one of the reasons the Aboriginal Heritage Act 1972 is currently failing to be an effective instrument for managing Aboriginal heritage sites, as there is little consideration on the variability of the concept of ‘significance’ and ‘importance’, and what is worthy of protection. To investigate the general publics opinion on Aboriginal heritage, a survey with SoGo Surveys (sogosurvey.com) has been launched. The newly launched survey is garnering some interesting preliminary results, notwithstanding considerations of sampling methods and bias which will require further consideration and possible adjustment. Of the 193 survey respondents so far (31.4% from WA, 59.3% from Australia and 8.26% from overseas)– respondents were overwhelmingly female (80%). 69% of respondents state they have had exposure to Aboriginal culture, and 90% of respondents state they value Aboriginal heritage . James Price Point– significant to the Goolarabooloo Aboriginal people partly because it forms part of the Lurujarri Songcycle, but would not necessarily be considered ‘Aboriginal heritage’ to the wider uninitiated population. An example of the divergent views on what constitutes an Aboriginal ‘site’ in Western Australia. Photo: Liz Vaughan. This is my first time using SoGo surveys, and so far the experience has been positive. You can simply run a report on your data online to produce an easily readable bar graph, or you can export the data to excel or other programs. When launching your survey you are offered tailored links that suit different platforms (for e.g. single or multi-use links that you can email, publication to Facebook, links you can embed on a website or blog. I changed from Survey Monkey to SoGo Surveys because Survey Monkey has has limit of 10 survey questions with their free subscription, whilst SoGo Surveys doesn’t have that limitation. In the future I will write a post on my experiences with sampling, bias considerations and promotion through social media, until then here are some links to some other resources, from Web Survey Methodology and the University of Sydney. Prepared by Liz Vaughan, Honours Student, Archaeology Department, University of Western Australia, 2014. Figure 1 displays data received from the Department of Aboriginal Affairs (DAA) on the number of sites reported (blue), ACMC assessed (red), determined as sites (green) and not being a site (purple). There are some important factors to note when interpreting the data. Firstly, the DAA has a 70 day performance target for assessing section 18 notices, from lodgement to Ministerial decision. Therefore the sites lodged within a particular month are unlikely to have a relationship with the sites assessed for the same month, i.e. the ‘Aboriginal heritage places’ that are assessed by the ACMC for any month would have been lodged with the register approximately 8 weeks previously (Chapple & Collier 2014). The Department of Aboriginal Affairs reported the data for the time January 2011 to June 2013 expressed in Figure 1 in 6 month periods. The data from July 2013 to May 2014 was reported in 1 month periods (see break down in Figure 2), but has been summed and expressed here in 6 month periods in order to be meaningfully compared to the previous data reported in 6 month periods. It has been stated by the Minister for Aboriginal Affairs that most of the sites lodged within the period of July 2013 to May 2014 were submitted with notices lodged under Section 18 (Chapple & Collier 2014). There has not been information provided if this is also the case for the months January 2011 through to June 2013. Sites submitted with notices lodged under Section 18 can affect the interpretation of the data in a number of ways. These sites may not necessarily have been submitted because of their significance or importance by the reportee, but rather as part of a heritage site avoidance or salvage operation in accordance with land use that may disturb an Aboriginal site. It should also be noted that the period January to May 2014 represents 5 months, not 6 months like all other periods. This represents the most up to date information released by the DAA. Interestingly, it can be noted that the January to May 2014 period represents the largest amount of reportings for the entire time reported on, despite being only a 5 month period. This is an effect of the huge spike in reportings in March and April 2014, as can be seen from the higher resolution break down of statistics in Figure 2. 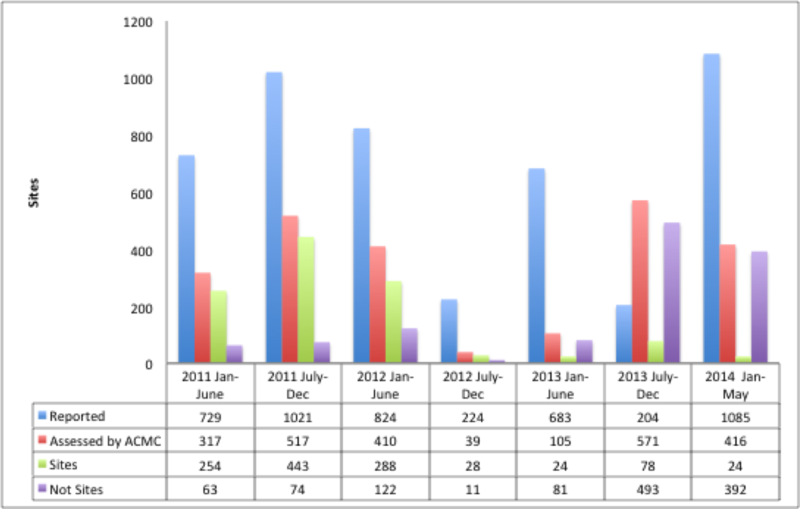 Figure 2 displays numbers of Aboriginal heritage places lodged with the Registrar of Aboriginal Sites under Section 15 of the AHA from July 2013 to May 2014 on a monthly basis. The total number of Aboriginal heritage places lodged for the corresponding month are expressed in (blue). Aboriginal heritage places that were assessed by the ACMC for that month are displayed in (red). Aboriginal heritage places assessed by the ACMC as a site is displayed in (green), and those heritage places assessed as being not a site are in (purple). Notable in this graph is the spike in sites reported in March and April 2014. The electronic Heritage Information Submission (HIS) forms as part of the Aboriginal Heritage E-lodgement Program (AHELP) were announced as ready to roll out in an email issued on the 10th of April 2014 by John MacDonald, Director of Approvals & Advice at the Department of Aboriginal Affairs. The HIS forms have been available online from the Department of Industry website since June in final form, and for 2 months before that in draft for testing (MacDonald, J. Pers. Comms. 2014). It was announced that the paper-based versions would not be accepted by August 1 2014 (MacDonald, J. Pers Comms. 2014). 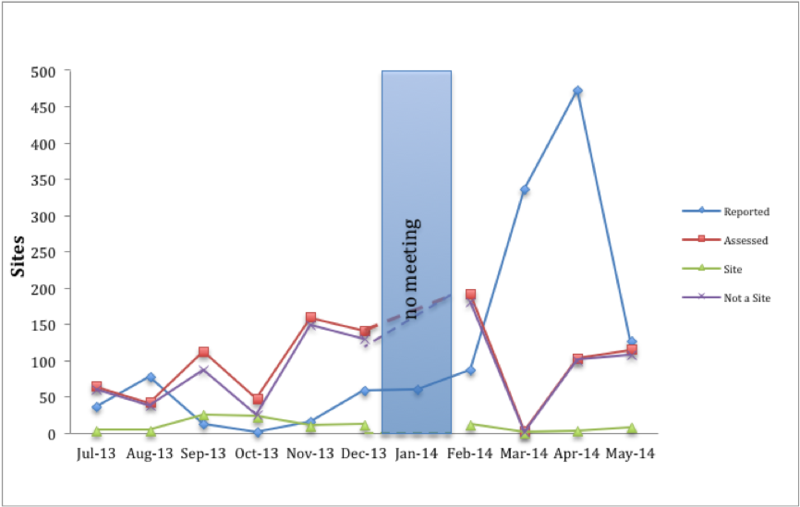 This spike in site reportings in the March and April period may reflect the introduction of the draft HIS forms, as ease of use would be expected compared to the previous paper based forms. These places were processed in line with the Department of Aboriginal Affairs’ 70-day performance target for section 18 Notices from receipt to Ministerial decision, and were therefore assessed by the Aboriginal Cultural Material Committee approximately eight weeks after lodgement with the Registrar, as stated by Minister Collier in Question on Notice, Tuesday, 24 June (2014). 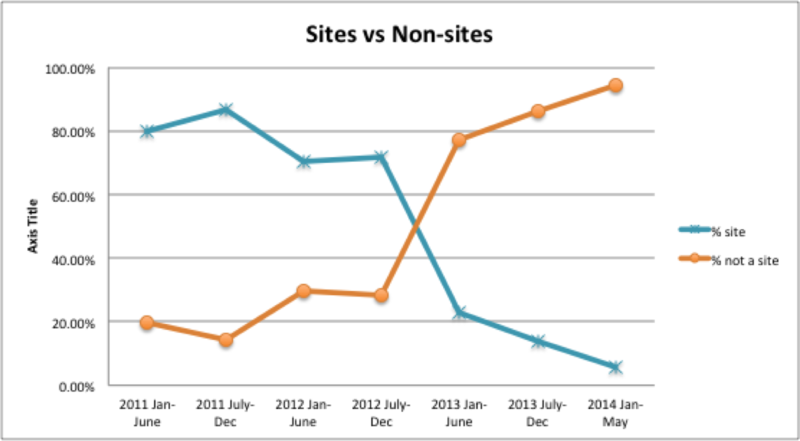 Therefore the number of sites assessed by the ACMC within a month does not have a relationship with the number of sites lodge for that same month. The 70-day performance target was pointed out by Minister Collier on the 24 of June 2014 in response to questions on notice. It is not clear when this became a target for the DAA, but it came out of the Keating Review in 2002 (MacDonald, J. Pers. Comms. 2014; Keating, M. 2002). Therefore the approximate eight week delay can be assumed to apply to all data presented here. According to the DAA most of these sites lodged were submitted with Notices lodged under Section 18. Note also there was no ACMC meeting in January 2014. Figure 3 displays Aboriginal heritage places lodged (blue) with the Registrar of Aboriginal Sites from July 2013 to May 2014, places assessed by the ACMC (red), determined as sites (green) or not a site (purple). Once again please note due to the high resolution of the data (monthly), there is no relationship between potential sites lodged (blue) and potential sites assessed by the ACMC (red), as is explained above. Chapple, R. and P. Collier 2014 Question on Notice, Tuesday, 24 June 2014. Legislative Council: Western Australian Government. Keating, M. 2002 Review of the Project Development Approvals System: Government of Western Australia. MacDonald, J. 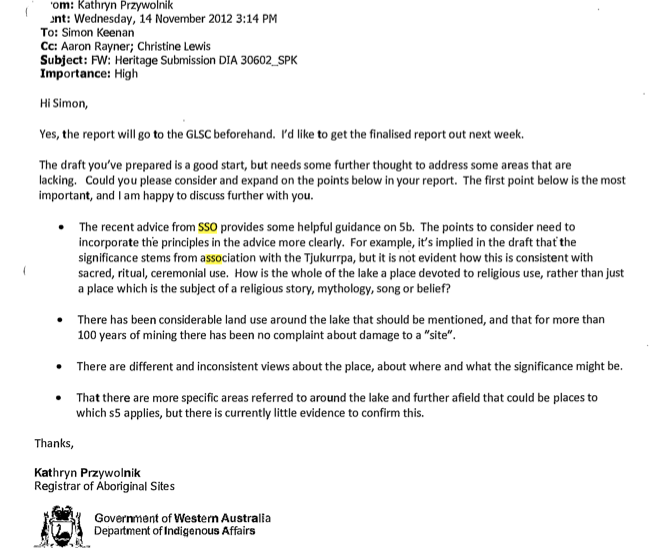 2014 Department of Aboriginal Affairs officer to Elizabeth Vaughan Email string on August 29, 2014. Wyatt, B. & Hames, K. 2013 Western Australia Hansard 7 August 2013, p.3005b. Legislative Assembly: WA Parliament. 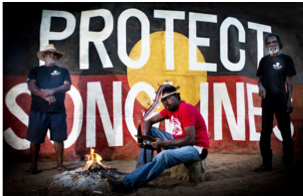 The Changing Nature of WA’s Aboriginal Heritage Laws, ‘progress’ or ‘regress’? The West Australian government trying to pass the Aboriginal Heritage Act Amendment Bill 2014. The changes have prompted some critical responses from communities of interest (Aboriginal groups, archaeologists, anthropologists, politicians, community members, etc), and there is also a large amount of confusion surrounding the changes. This blog aims at providing a resource of documents, investigations and findings on the legal protection of Aboriginal heritage in WA, and past and current changes. This information comes from research undertaken by Elizabeth Vaughan as part of her honours dissertation in archaeology at the University of Western Australia. Elizabeth is producing a thesis titled Excavating the Aboriginal Heritage Act: The evolution of heritage protection in Western Australia, 1972-2014. This blog is designed to provide a locus of data on the changes to the Aboriginal Heritage Act that is publicly available, with the aim of influencing sensible and practical changes to the Act that will find traction with all users. Below is a link to statistical information regarding site registration from 2011 to 2014, showing site registration by the Aboriginal Cultural Materials Committee has decreased from 80% to 6% .